I made four trades in the month of March (three sales and one buy). My dividend income was up 22% y/y in March. For the first quarter, my dividend income was up 14.15% y/y. Every month, this is my favorite article to sit down and write. That's because the first thing I have to do when getting started is log into my brokerage accounts and tally up the prior month's dividends. Adding these totals into my long-term dividend appreciation chart provides concrete evidence to me that my dividend growth investing portfolio strategy is working. Well, this month I'm even happier to write the piece because March of 2019 was a record month for me in terms of monthly dividends received. My March dividends came in 22% higher than they were in March of 2018. And, my first-quarter dividend total was up 14.15% y/y. Without a doubt, the strategy is working, and I couldn't be more pleased knowing that I've taken yet another step towards financial freedom via passive income generated by my dividend growth holdings. 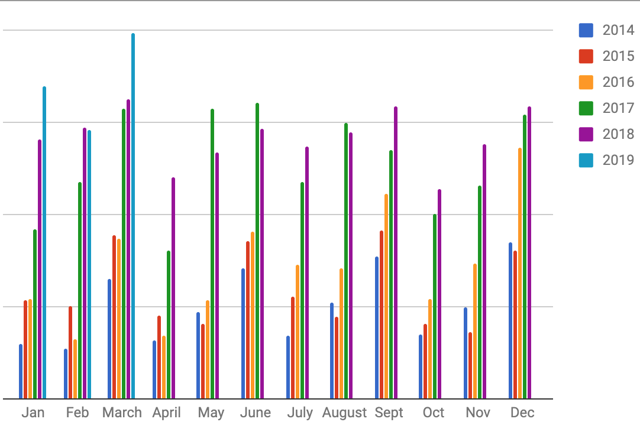 Now that my Marketplace service, The Dividend Growth Club, is up and running, this monthly portfolio report is even more important to me because it's the primary way that I will be discussing the trades that I make with the public. Prior to The Dividend Growth Club, I would post all of my trades as stock talks here at Seeking Alpha in real time. For six years, I posted every single trade that I made as a stock talk; however, I've decided to make that information exclusive to subscribers. Moving forward, I know that for many of my readers, these pieces will be how they'll keep track with what I've been up to in the markets. With that in mind, I'll do my best to lay out my trading logic in these pieces so that the conversations that we used to have on my stock talks can continue here. In March, I made four trades. Early in the month I sold some of my Bristol-Myers Squibb (BMY) shares because the stock had run up nicely since I bought it back in January for $44.88. I've written about my trading habits with BMY a lot here over the past couple of years. To me, BMY is a trading vehicle and not a long-term DGI investment. This is because the stock does not have a great dividend growth history. BMY has been giving investors low-single-digit increases for the last decade, and while I respect the fact that BMY's management is increasing the dividend annually, the company's yield is too low for me to accept a ~2% annual increase. With that being said, BMY does yield more than 3%, and while its growth prospects aren't attractive to me, I do think the yield is safe, which makes it an easy stock for me to trade. I've bought and sold BMY numerous times in the recent past, and it's nice to know that I'm paid a rather handsome fee while I wait. As I said in the stock talk, I've locked in double-digit profits on BMY trades seven times now. For those of you familiar with the rule of 72, this means that I've more than doubled my money on these deals. While I'm not typically a short-term trader, I am proud of these results, and my BMY trades have taught me that it's nice to have a trade or two on at all times within my grander DGI scheme. It keeps me on my toes. Another thing that BMY has taught me is this: understand the difference between a trade and an investment and make sure that they're treated as such. What I mean is this: since when I bought BMY, my plan was never to hold it long-term, so I shouldn't be scared to take profits. Any profits I make on a trade represent success. Because of this, there is no reason to be greedy, hoping for more. I think BMY's fair value is somewhere in the $55 range. So, once the margin of safety on any shares that I've bought cheaper than that evaporate as the share prices appreciate, it's time to exit the stock. The market is volatile. Biotech/pharma names are especially volatile. And, if riding this BMY roller coaster has taught me anything, it's that sales will always occur in the market. There's no need to be greedy because more likely than not, you'll have another opportunity to buy a ticket. And speaking of buying another ticket, the second trade that I made this month also involved BMY. I sold my shares for $52.96 on the 6th and used the proceeds from this trade to buy them back for $49.12 on the 15th. At ~$49, BMY shares were only ~7% cheaper than they were when I previously sold them. But, since such a short amount of time had passed, I was happy to get back into the trade. Right now, it appears that BMY is trading based upon the sentiment surrounding the Celgene (CELG) deal (when the market thinks the deal will fall through, BMY shares rise, and when the market thinks the deal becomes more likely to succeed, the BMY shares fall). Well, since I remain bullish on the prospects of the potential combined company, I'm happy to buy shares when they're down on what I believe to be good news. Since buying BMY shares at $49, they've continued to sink, down to the $47 level. I'd be happy to add to my BMY position around the $45 area. That's where the stock recently found support in the immediate aftermath of the Celgene announcement and the value at that level seems obvious to me. Obviously all trades involve speculation, but the way I see it, there are likely three outcomes here moving forward. One, the deal goes through, and I end up owning a large stake in one of the world's leading oncology companies. If this happens, I'll have the option to sell shares at a profit or hold them long-term term, depending on how the new company fits into my portfolio at the time. If I'm under water, I'll obviously hold because I hate selling stocks at a loss. If I have to wait a while to sell because M&A (or some sort of unforeseen macro event) puts pressure on the stock price, that's not a bad place to be, especially when that company is offering a 3% dividend yield. I'm more than happy to be patient holding shares of high-quality companies when they're contributing to my income stream. Or three, the deal falls through and BMY shares rise back to the ~$55 level where they traded prior to the deal being announced because the balance sheet won't be loaded up with billions of new debt, and I'm able to lock in double-digit profits again. To me, it's a win-win-win situation either way. The last two trades that I made in March were sales. In late December/early January, I dipped into my cash position, putting money to work in what I believed to be an irrationally undervalued market. The trades that I did make during that sell-off brought my cash levels down lower than I'd like for them to be so late in an economic expansion. So, with that in mind, I decided to take some profits here a few months later since the market has experienced a strong V-shaped recovery and no longer offers the same value that it did before. I'm able to make purchases during sell-offs because I always make sure that I keep some powder dry. However, that powder doesn't grow on trees and for me to be able to capitalize on market weakness, I have to also be willing to prune my holdings, reaping the benefits of market strength so that the process can play itself out again during the next sell-off. So, with that in mind, on 3/22/19 I sold a small portion of my Apple position for $193.11/share and I liquidated my entire General Mills (GIS) position at $50.67. If you've followed me at all, you probably know that I'm a huge Apple (NASDAQ:AAPL) bull. I assure you, that sentiment hasn't changed. Apple has been my largest holding for a while now. Last August, when Apple was an absolute market darling, priced at $215/share and posting new highs on a daily basis, I wrote an article questioning its valuation and asking the question, should I sell some shares? In the end, I decided not to, because while Apple no longer appeared cheap to me at nearly 19x earnings, nothing had changed operationally and I still believed that the company had set itself on a path towards dividend aristocracy. Well, AAPL cruised path $215, topping out above $233. At that point in time, the company's weighting within my portfolio had exceeded 10%. This made me nervous, but I continued to hold, believing that AAPL was a core holding. I maintain this belief to this very day. Because of my bullish conviction of AAPL shares long-term, when they sold off late last year, I made two more purchases at $186.50 on 11/14/18 and at $142.10 on 1/3/19. Apple's sell-off had lowered my exposure to the company, yet I knew well and good when I made these two purchases that I was very overweight the name and, therefore, these two purchases were likely to fall into the trade category rather than the investment category. In other words, I'm more than happy to have the vast majority of my AAPL position run for years and years. Heck, I hope to retire off of the income that AAPL generates for me a few decades down the road. But, in the short-term, I'm also happy to mitigate the risk of having such high exposure to an individual company by taking profits. So, that's where this AAPL sale comes from. On 3/22, I sold the shares that I bought for $142.10 in early January for $193.11, locking in ~35% profits in just three months' time. I plan on selling the shares that I bought at $186 somewhere in the $225 area. Assuming I get that opportunity one day, AAPL will still likely by my largest holding by a long shot. Right now, AAPL makes up ~8.9% of my portfolio. I'd like to keep that weighting somewhere in the 7-8% range. For perspective, Disney (DIS) is my second largest holding, making up ~5.9% of my portfolio, and Alphabet (NASDAQ:GOOG) (NASDAQ:GOOGL) is my third largest holding at ~5.5%. The majority of my holdings are 1-2% weightings, so having a name at ~10% really begins to dominate things. The other sale that I made in March also represented the successful book-end of a trade. I bought General Mills back in March of 2018 for $45.11. At the time, the stock was selling off in response to the Blue Buffalo deal (which I actually liked), so I was happy to pick up some shares. However, I also acknowledged that the Blue Buffalo deal was going to likely put an end to GIS's dividend growth (in the near-term, at least), and because of this, GIS fell into a similar boat as BMY to me: a high-quality name with a safe yield, but unacceptable dividend growth prospects, so therefore, the stock would be viewed as a trade rather than an investment. Well, flash forward a year later and after more volatility than I expected from an old guard packaged foods name. I didn't time the bottom on GIS nearly as well as I did with Apple; GIS shares hit a 52-week low of $36.42 in December, meaning that it wasn't all that long ago that I was sitting on unrealized losses of nearly 20%. I obviously thought that GIS and its 4.5% was more defensive than it really was. Because of this miscalculation, when the stock rallied (unexpectedly, I might add) in 2019 and I had an opportunity to sell shares, locking in a gain of more than 12% (plus a year's worth of hefty dividends), I was more than happy to do so. I don't think that GIS's growth prospects justify the recent uptick in share price. I bought shares when I believed they were irrationally cheap and I sold them when I believed they were irrationally expensive. Buying low and selling high, that's the name of the game. So, with the trades of the way, let's get into my favorite part of these monthly recaps: my dividend income. As you can see on the graph below, my steady trend of dividend growth remains intact. As I said in the intro, March's dividend income was up 22%. Q1's income was up 14.15%. This is great and right now I'm still on track to post ~20% dividend growth figures for 2019 as a whole. That annual estimate may vary some. If the rally that we're experiencing continues, I may take profits elsewhere from my portfolio, which will hurt my income outlook in the short-term. However, I'm able to grow my income so rapidly because I'm constantly looking for opportunities to sell highly valued stocks (whose elevated prices result in a lower yield) and re-deploy those funds to attractively valued stocks with higher yields. Either way, I still expect 2019's income to come in well above 2018's, which is amazing to see. I hope you enjoyed this month's recap. Until next time, best wishes all! If you enjoyed this content and want to see more like it, please check out my Marketplace service: The Dividend Growth Club. DGC members have access to sample portfolios spanning different dividend yield thresholds, weekly Nick's Picks articles, highlighting the best DGI values I see in the market, real-time access to Nick's Portfolio and trade updates, and a vibrant chat room where an income oriented community has come together to share ideas. Feel free to take advantage of a free trial offer! Disclosure: I am/we are long BMY, AAPL, DIS, GOOGL. I wrote this article myself, and it expresses my own opinions. I am not receiving compensation for it (other than from Seeking Alpha). I have no business relationship with any company whose stock is mentioned in this article.